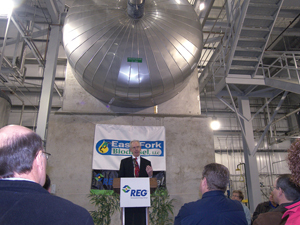 The new East Fork Biodiesel plant in Algona, Iowa, produces 60 million gallons a year. Renewable Energy Group's unique business model has created a group of biodiesel plants with 220 million gallons ofannual capacity, and that network con-tinues to grow, with its first 60-million gallon capacity plant recently opened in Iowa. Renewable Energy Group Inc. (REG) may now have seven network facilities, three company-owned plants, 100 employees, an annual biodiesel capacity of over 220 million gallons, and serve customers worldwide, but they weren't always so big. The business got its start in 1996, when it was part of West Central Cooperative, one of the largest agricultural businesses in Iowa. "We started out converting soybean oil into biodiesel as an added improvement to the oil," says REG chief operating officer, Daniel Oh. along with its technology partner, Crown Iron Works, opened the world's largest (12 million gallons) continuous-flow processing plant in Ralston, Iowa. "And ever since then, we have grown by leaps and bounds and are now the leading marketer by volume in the country," says Oh. REG has grown in every conceivable way. It's now a full-service biodiesel company offering: plant management, risk management, raw material procurement, plant construction management, biodiesel production, and biodiesel sales and marketing services. Even the plants themselves have grown in size. They went from 12-million-gallon capacity plants to building 30-million-gallon plants. Their newest network plant, which started processing in December 2007, is a 60-million-gallon capacity facility. And all the plants process virgin feedstock due to the large volumes available and its homogeneous composition. From the outside, REG looks much like other renewable energy companies that own their technology, build plants and then maintain those plants. But it really plays a more complex role. "We provide the entire commercialization value chain," says Oh. Long before the groundbreaking of a new plant, REG will have closely analyzed the future of the facility. It will have determined where the company's feedstock will come from, chosen the best technology to handle it, established where the market is and what transportation will be required. Based on all of that, it will determine the size of the plant and choose a site with good access to incoming and outgoing resources. And that's just the preliminary work. Once the plant is operational, it will handle all the plant operations-from risk management to environmental and regulatory compliance. And REG's experienced sales and marketing organization will ensure the high quality fuel gets to the end users in the U.S. and overseas. Normally, a network relationship begins with a group of entrepreneurs who are interested in owning and operating a biodiesel plant, working with REG to design and build the plant. Once the plant is in operation, the owners rely on REG to manage and run their operation with their guidance. REG, however, offers a variety of relationship opportunities. "People can do business with us on just about any part of our production value chain," says Oh. "If somebody wants us to upgrade their plant, consult, train, manage their logistics, or market their fuel, we can do that. But people tend to choose a full service relationship with us, because that lets them benefit from economies of scale that individually they wouldn't have." The new East Fork Biodiesel plant in Algona, Iowa, is one of those companies that chose the full service option. It is the newest member of the REG network and the network's first 60-million-gallon capacity plant. Dave Rosenmeyer, general manager of the East Fork facility, explains how REG became involved. "We have around 1,600 investors in the plant-ag producers, farmers, and business leaders-anyone who believes in renewable fuels. Once they decided to build a plant, they went out and interviewed, recruited and went through a selection process to choose a management company they felt could provide the whole package, from the environmental health and safety to operations, employee recruitment, and sales and marketing logistics."
. a loading and receiving area for trucks and railcars. East Fork is a multi-feedstock facility and can process both soybean and other vegetable oils. But soybean is the prime feedstock. The plant was strategically located in Kossuth County, the largest soybean-producing county in Iowa. 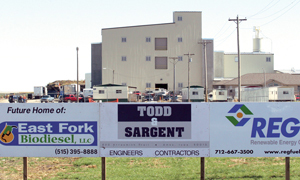 Celebrations for the start-up of the East Fork Biodiesel plant (right). Soybean oil is the prime feedstock for the plant, which is strategically located in Kossuth County, the largest soybean-producing county in Iowa. Like other network plants, East Fork produces the biodiesel and REG markets it. "We [East Fork] work very closely with REG to ensure that the customers are getting exactly what they've ordered and within the timeframe required for shipment," says Rosenmeyer. Oh says that although there are other companies that build plants and manage them, what sets REG apart is its uniform quality and standards. "Because of the way we manage our plants, we can ensure delivery of large volumes of very high quality, supplier-assured product to any customer in the country." In fact, REG's Ralston, Iowa plant is a BQ-9000 Accredited Producer as are many of the other plants in the network. This provides extra confidence to customers. "At last count, there are three companies in the U.S. who have attained both BQ-9000 Accredited Producer and BQ-9000 Certified Marketer status," says Oh. Because biodiesel is used differently in the U.S. than it is in Europe-a business-to-business fuel for trucking fleets, municipal fleets versus a general consumer fuel-the sales and marketing team has to be in tune with those businesses. "Businesses may feel they are putting their capital at risk-their boats, ships or trucks," says Oh. "They have to know that when they put the fuel in that it's not going to muck it up. They can't have anything, especially fuel, slow them down." th a distributor. They also provide delivery to government or corporate entities across their distribution system. "We can bring to bear middle market to larger market corporate capabilities that typically are uncommon in what is a growing industry," says Oh. Each year REG's production and distribution numbers have grown. In 2006, it had a 27 percent market share in the U.S. In 2007 the company marketed more than 100 million gallons. And things aren't slowing down. "Our current production capacity is over 200 million gallons," says Oh. "We're continuing to grow the network. We will continue to sign network partners and we are growing on our own account as well." Seeing itself as a vital piece of the future of the biodiesel industry, REG is very involved in helping influence the government to establish a renewable fuel standard (RFS). "The current figure is 1.25 billion by 2012. For the first time ever, we have a hard, definite usage standard within the country." Oh sees the RFS as validation of biofuel. "It serves as a platform on which we'll grow over time. I certainly expect as feedstock becomes available that renewable fuel sources will increase." REG doesn't view biodiesel as a food versus energy issue. "When you increase the availability of the triglycerides that are in the oils and fats that we use, you are increasing the availability of food. And the oil and fat that we're using are for the most part undesirable as food items," says Oh. The biggest thing that will affect the growth of biodiesel, he says, is the availability of feedstock, and what he calls industrial oils-items being grown and developed for specific energy use or other non-food chemical application. The growth, he believes, unlike some other industries, won't be dependent on new technology, but the greater access to triglycerides. In short, new innovations in feedstock. And innovation is something REG is ready for. "If somebody comes to us with a viable triglyceride, we can use it and we can turn it into biodiesel," says Oh. "When you think about R&D, there are lots of people who are big on the R. We're really big on the D and the commercialization. We're a company that can make it and grow it quickly." "We're not like a Monsanto," he adds. "We're not doing GMO or other activities to find the next best soybean. But we can help someone look at their oil and tell them if it will work, and if not, how to change it." The entire REG team is looking forward to being part of the new page in the energy story. "It's an exciting industry today, and it's a really exciting future," says Oh. "We can really start seriously thinking about supplementing and augmenting the petroleum supply."